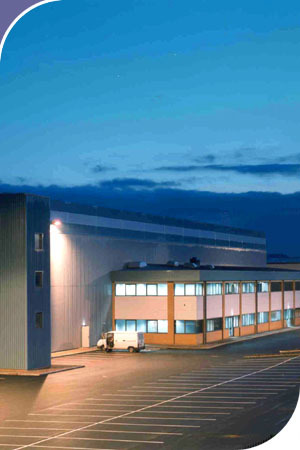 We were commissioned to design a new 240,000sqft Processing Centre for T.K. Maxx in Newcastle under Lyme, including a two storey 12,000sqft office facility with staff accommodation general office space. The warehouse is 11.6m to the underside of the steel haunch and has 20 loading doors to one elevation. The site has parking for 500 cars and 50 articulated lorries in two trailor parks. There are two secure site access points, one for cars and one for lorries, and the whole site perimeter is protected by a continuous 2.1m high palisade fence. The building is fully sprinklered with on site water storage facilities.